Aung San Suu Kyi Scores 1st Win in Myanmar's Crumbling Peace Process - Integration Through Media ....! 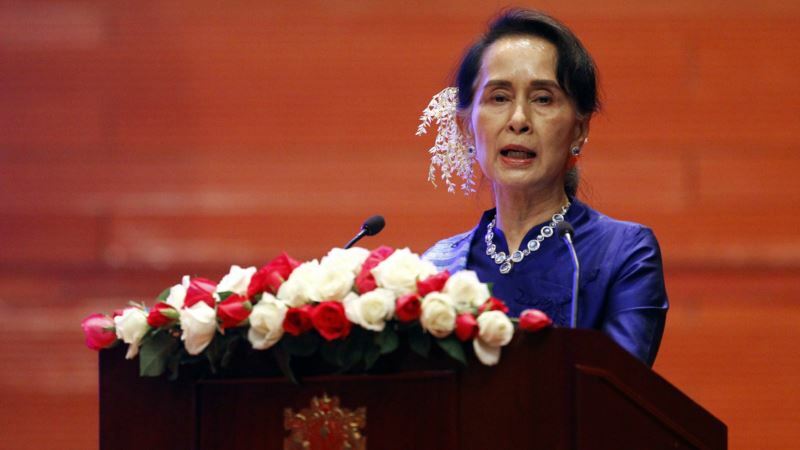 (VOA): Two ethnic armed groups added their signatures to a “nationwide” cease-fire pact with the Myanmar government, marking Aung San Suu Kyi'sfirst concrete win in a peace process undermined by recurrent conflict and stalled dialogue. In a televised ceremony in the capital Naypyidaw on Tuesday, the New Mon State Party (NMSP) and the Lahu Democratic Union (LDU) assented to a document the government insists is key to resolving more than 50 years of civil war between the military, dominated by the ethnic Bamar majority, and minority ethnic groups. The NMSP, representing the Mon ethnic group, has been a prominent player in peace negotiations and for decades has run parallel government structures, including schools and law courts, in southeastern Myanmar. However, the LDU, representing the Lahu of northeastern Myanmar, is a small group that lacks military or organizational clout. The U.S. Embassy called Tuesday's signing “but one of the many steps on a long road to sustainable peace.” Western governments consistently have backed Myanmar's peace process, offering advice and helping finance negotiations via a Joint Peace Fund. Entering government in early 2016, Aung San Suu Kyi's National League for Democracy (NLD) inherited a process begun by a military-backed administration whose crowning achievement was the signing of a Nationwide Cease-fire Agreement with eight, out of close to 20, ethnic armed groups in Myanmar in October 2015. The NLD, whose landslide election victory extended to most ethnic minority areas, pushed peace to the top of its governing agenda. Shunning the back-channel approach favored by the previous government, Aung San Suu Kyi has tried to spark public enthusiasm with a series of grand-scale peace conferences. At the last conference, held in May of last year, the government and military reached agreement with the eight signatory armed groups on a number of vague “principles” that would form the core of a peace deal and, in turn, a new federal system. Myanmar's constitution, drafted under military rule, centralizes government and control of resources to the exclusion of minority ethnic groups. It also grants the military control of all security agencies, allowing them to pursue brutal objectives without civilian oversight. The autonomy retained by the military has proved fatal to Aung San Suu Kyi's efforts to build trust with the majority of armed groups that remain outside of the Nationwide Cease-fire Agreement. The military has been laying siege to one of these groups, the Kachin Independence Army (KIA) in Myanmar's far north. In January, several thousand civilians were trapped in an amber-mining region while shells rained down on nearby KIA bases. Agencies bearing relief for displaced communities run up against tightening military blockades. Several embattled groups ranging along Myanmar's long border with China, including the KIA, have formed a Northern Alliance that rejects the government's current cease-fire deal. Together, the alliance commands the most significant firepower in Myanmar outside of the military. Seeking leverage, it has tried to draw China into a peace process that has so far avoided international mediation. Deliberately or otherwise, military actions have also undermined Aung San Suu Kyi's efforts to win over groups outside of this more hardline Northern Alliance. The Karenni National Progressive Party (KNPP) was tipped to sign the nationwide cease-fire agreement alongside the NMSP, but the December killing of three KNPP soldiers and one civilian in disputed circumstances in Kayah State has severely antagonized ethnic Karenni civil society and put off KNPP participation indefinitely. The military also has obstructed the holding of community consultations by signatory armed groups. In December and January, the Restoration Council of Shan State was summarily blocked from hosting a number of public meetings. Min Zaw Oo, executive director of the Myanmar Institute for Peace and Security, told VOA this has chilled cooperation on national-level political dialogues between signatory armed groups and the government. “When one side proposes a meeting, the other now rejects it,” he said. This was kept deliberately vague, after the military and the ethnic armed groups advanced competing definitions. The former pushes a doctrine of Disarmament, Demobilization and Reintegration (DDR), while the latter urges Security Sector Reform — the integration of minority ethnic forces into what is now an overwhelmingly Bamar army. Since last May's conference, however, the military has doubled-down on its call for ethnic armed group disarmament as part of a peace deal. “Once they have decided to sit down together, and explore ways, there could be some solution,” he said. Min Zaw Oo said the peace process wasn't on the verge of collapse. “We are currently at the stalling point,” he said, projecting progress to pick up in the middle of this year.